What a great shot. Congratulations on your award. Fantastic Photo, however, it was a risky place to send a friend. WoW, it makes me think, where were you in order to take this huge view!!! Excellent! Good for you! And what an amazing view. Beautiful and thrilling at the same time. My biggest fear is heights! What a spectacular shot! 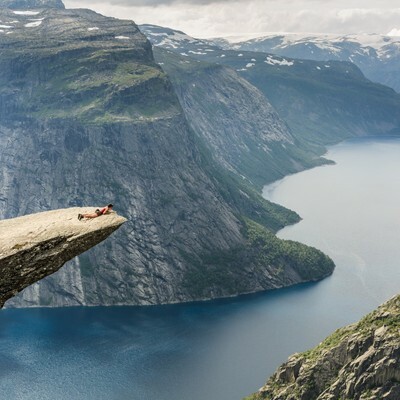 And this spot are called Trolltunga. The tongue of a troll. Made my heart skip when I first looked! Amazing shot! Congratulations on being a finalist. Congratulations on being a finalist. Fabulous photo. Awesome, breathtaking, scary and beautiful......Best photo I have seen in a very long time. WOW! Congratulations for all your wins! great shot but I feel the person in it deserves the praise I could not go there. Awesome shoot, Congratulations, well deserved, wow, what a look out post, for the Vikings, ship that coming from the rampage, I must go there, see with my own eyes! AWESOME, AWESOME CAPTURE! I love it ! This is truly an adrenaline rush. I am sure that this in not for the faint of heart!. Congratulations on being a finalist. I hate heights, and get so uncomfortable seeing them...you've got me cringing #JobWellDond ???????????????? One of the most adrenaline filled places I've been to, Trolltunga Norway. After a small 4 hours hike up you can, if you have gathered enough courage, walk all the way to the end of the trolls tongue. Bellow it, a 300 meter drop straight down. I did it!